I finally made the nearly two hour drive to Richmond to fulfill our Crate & Barrel registry yesterday. It’s unfortunately the closest location to our home in Virginia Beach. 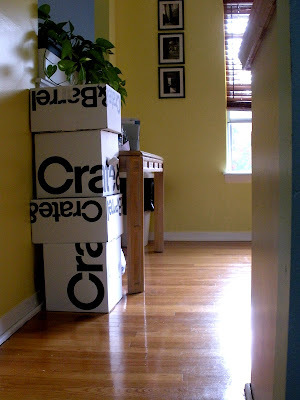 After I finished unpacking and washing all of our new everyday dishes and packing up our old set to be given to a friend, I was reminded of how much I love Crate & Barrel’s use of typography when I took a look at the stacked boxes in the kitchen. © 2019 beth brevik All Rights Reserved.